A series of studies performed by two professors at Rutgers University took a look at people's reactions upon receiving flowers, and found something interesting: They elicited true happiness in 100 percent of the people who received them. In the first of three studies, Jeannette Haviland-Jones and her husband Terry McGuire, both of Rutgers University's School of Arts and Sciences, measured the difference in reactions between receiving a bouquet of flowers, a basket of fruit and a candle. During the 2005 study, two researchers gifted 147 participants with one of the three items, supposedly as a way of thanking them for their participation. In reality, the researchers were analyzing the participants' reactions. Every single person who received the flowers exhibited genuine happiness, which was measured by what's called a Duchenne smile (a sincere smile that involves the mouth, cheeks and eyes). The fruit only received smiles from 90 percent of the recipients and the candle got a smile from just 77 percent. Then, in interviews performed three days later, the participants who'd received flowers were significantly happier when questioned about their mood than those who'd received fruit or candles. In another study, researchers looked at not just the effects of receiving flowers, but the overall mood changes of living with them. The 2006 study from Nancy Etcoff, a clinical researcher in psychology at Harvard, looked at 55 women over the course of two weeks to determine how much of an effect flowers could have on women's moods. The results? After being around flowers – even for just a few days – women reported feeling less stressed, more compassionate, more energetic and happier in general, according to The Crimson. Why Do Flowers Affect Happiness? Clearly, flowers have the power to elevate people's moods, both right away upon receiving a bouquet and even after living with them for several days. Many people believe this has to do with their visual beauty, including the vibrant colors and symmetrical appearance most flowers exhibit, as well as their sweet odors. And when flowers come from friends and loved ones, they're even more special. 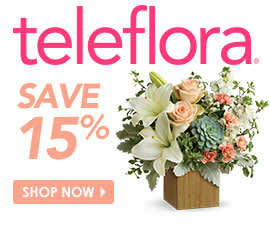 Make one of your loved ones feel happier by sending them a bouquet for no particular reason! Teleflora's Sunny Smiles bouquet features yellow and pink blooms, including roses, lilies and alstroemeria in a bright and cheerful yellow vase. It's a sure way to put a Duchenne smile on a friend or family members face!